The pearls jewelry is the ultimate imitation jewelry for all the occasions & the the best gift ever to te brides for thier time.This Magnficient Tiny white beads with White Pearls accented in beautiful Necklace & earrings Set is the FABLOUS & gived all freshing & cool impact to you after wearing. The white color is itself very soothing. All time wear at all festives JUST for you!! 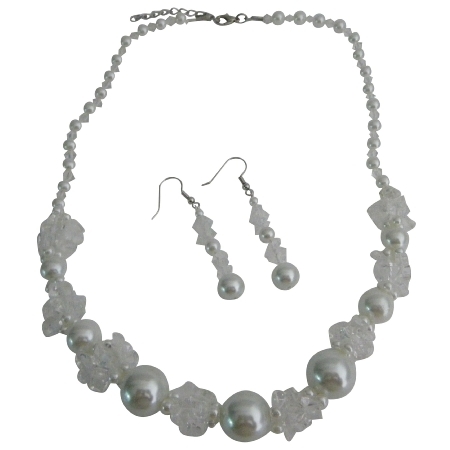 THE EXOTIC.White FRESHNESS & COOLNESS Is the GRAND Gift of this Necklace Set. The one & only one beautiful YOU.THE GORGEOUS ONE!! After wearing this Jewelry.LOVE at First sight.